Nestled deep within the whirly passages of the snow-clad mountains, this frozen river also entices thousand of trekkers from different corners of the world. Popularly known as the 'Chadar Trek' due to the formation of the thick blanket of the snow, it is considered as one of the challenging as well as tricky treks in the world. CHADAR" refers to the blanket or sheet as the Zanskar river transforms itself from a rapid river into a white blanket of ice during winter, a frozen spectacle awaits the trekker to be experienced of glass ice ranging from a bluish tinge to golden yellow that is seen during the few hours that sunlight reaches directly into the gorge to the milky whitish on a moonlit night - as said a trek journey like no other. One of the toughest and most adventurous trek, the total distance of this tour (one way) is approximately 105 Km and will be covered with average distance of 15 to 17 km a day. The temperature remains minus 15 to 20 during the day time and – 25 to –35 during the night. After keeping all the facts in one’s mind bring your warmest Jackets and sleeping bags and good shoe. Most of the trek is done on the ice (Chaddar) but at some places we must climb icy rocks or trails. The Chadar walk isn't called the 'wildest trek in the world' for nothing. It's a primal trek on the Zanskar river, which is sheathed in ice each winter. We walk on ice, traverse across the gorge walls where the river thaws, and bed in caves that have been used by local travellers over centuries. Legends, history, culture and magical landscapes are an everyday affair on this walk, which is possible only during a window in the coldest months of winter. The trek follows an ancient trail used by the Zanskaris during the days of the Silk Road, when they walked this frozen highway all the way to Leh with wares they would trade for essentials. For those looking for adventure, action and bragging rights, nothing can hold a candle to the Chadar trek. As we fly over heavily snowed mountains for miles and miles we will realise how impossible it is to reach Ladakh by road in winters. Ladakh is an inhospitable region in winters, totally covered by snow, roads blocked temperatures plummeting upto -20 degress celsius. The chill is in the air and very few shops are open in Leh, the administrative capital of Ladakh. We spend the night here in a cozy and comfortable guest house. Chiling is 64 kilometers drive from Leh. It's also the starting point of our trek. The roller-coaster ride takes you along the Indus to the village of Nimu, where the Zanskar converges into Indus. There are quite a few heart-stopping moments as the vehicle negotiates the steep hairpin bends over snow covered road. The road goes past Chilling to Tilad Sumdo. 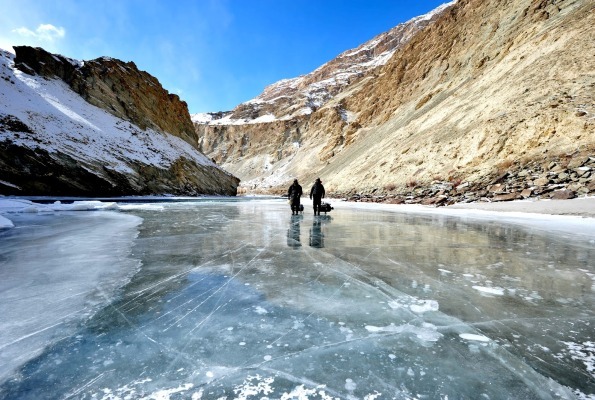 To reach the camp-site, you have to cross the frozen Zanskar; and this is when you take your first steps on the Chadar. It takes a while to get a hang of walking on the ice sheet. To get some exercise and keep warm, you can climb up the nearby mountains and get a good look at the frozen river. As the sun sets, it drags the temperature down with it, and the sleeping bags in the tents look quite inviting. 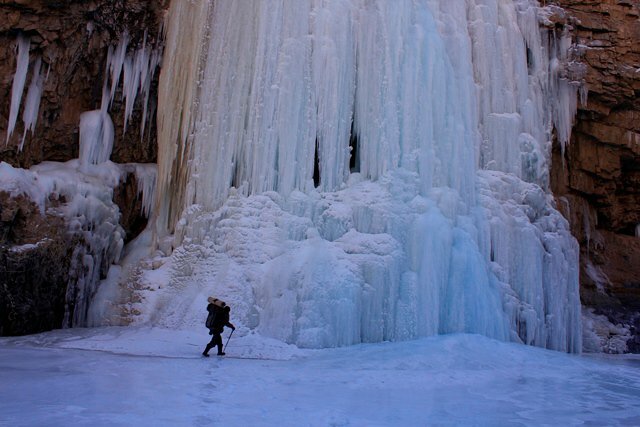 The morning walk on the Chadar may feel like a walk inside a deep freezer. Your face should be the only exposed skin but its enough to give the deep freeze feeling. As you walk on the Chadar, listen to the sounds it makes. Depending on the thickness of the Chadar, the sounds change. You will soon start recognizing where the Chadar is thick and where it is thin and dangerous. We may have to crawl or even roll over on our tummies to cross the thin sections. While on the Chadar, do not be surprised to spot pug marks. The big cats roam around pretty freely though they are elusive to the human eyes. After 6-7 hours walk we reach Shingra Koma which is a big camping ground on your right as you walk up stream. Its right below a huge stone wall which is straight out of a hollywood movie. The Zanskar river takes a beautiful turn right in front of the camp site and sharp peaks rise on the other side of the river. We set our camp here and after a delicious freshly cooked dinner, go back to snug into our sleeping bags and jackets in the freezing temperatures. The trek from Shingra Koma to Tibb is a long one. It is also one of the most beautiful days of the trek. Watch the small waterfalls on the left standing still in the form of icefalls. A couple of hours into the days walk brings you to a massive waterfall on the left. Prayer flags flutter on the trees in front of the waterfall. According to legend, this waterfalls has its source at Kailash in Tibet. The lunch point for the day is exactly mid way and under an overhang of rocks. Post lunch, the Zanskar river passes through narrow gorges where the width of the river can be covered by 4 people holding hands. The narrow gorge hardly gets any sunlight and so the river is non existent. Generally, a thick chadar forms end to end here. Walk through the various hues and forms of Chadar brings you to a large camping area on your right – Tibb. To the left again are caves were 8 to 9 people can be comfortably accomodated. The Tibb campsite also has more dry vegetation around. The trek from Tibb to Nyerak is 12 km long. This is the day when you encounter the much awaited frozen waterfall. The day is beautiful too going through the cliffs and gorges and valleys of Chadar. A kilometer ahead around a bend under the shade of the gorge lies the famous Nerak waterfall. The Nerak pul or bridge lies just ahead of the waterfall. The bridge is an old wooden bridge but can still take wait of 4-5 people at once. Its a nice experience walking on the rickety bridge and catching the sight of the waterfall from the top. The trail goes along the Chadar and brings you to Nerak where a small trail takes you up to the Nerak campsite. Nerak is a village located about 2,000ft higher than the river bed. The Chadar trekkers camp not at the village but at the camping ground 200 ft higher than the river. There is a lone shelter at Nerak campsite which serves as a Rafting point in the summer months. During winters, it serves as a shelter for the Chadar trekkers. Nerak is notorius for its really cold nights and winds. The temperature can dip as low as -25 or lower. This is going to be the coldest night of our your trek. However we at Holiday Dada will make sure you have enough shelter and warm sleeping bags and blankets for your safety. The return path is theoritically a retrace of the route you took the last 3 days but in reality can feel like a totally new one. The dynamics of the Chadar can make the whole place look and feel different. Old Chadar breaks, new ones form where there was none earlier, texture of the Chadar changes and so on.Sometimes the Chadar breaks right under your feet and floats away like a raft. You have no option but to run on to the safer sheet ahead. You see the same broken raft getting stuck somewhere downstream and other icicles clinging on to it to form a whole new Chadar elsewhere. The Chadar trek is an experience. Your experience and what you see will be totally different from anyone else's.